★☆☆☆☆ I like the overall weight. It feels like a quality razor, but the blade position is off both vertically and horizontally. I could live with with the vertical and treat it as a slant razor but not the horizontal. I just cut my losses and purchased a Parker Variant instead even though it's not a butterfly head. ★★★★★ Good little razor, very mild even with it turned all the way up. ★★★★★ Great piece. I like the weight to it and it gives me a nice shave. The blades are actually good. ★★★★★ I like the weight and feel of this, along with the adjustable part it is very nice. ★★★★☆ Finally, FINALLY an adjustable razor that adjusts mild enough for men with sensitive or easily-nipped skin, who shave every day. Due to its unique adjustment range, this razor can accommodate blades from the sharpest right out of the package to those with many shaves and are at the end of their useful life. 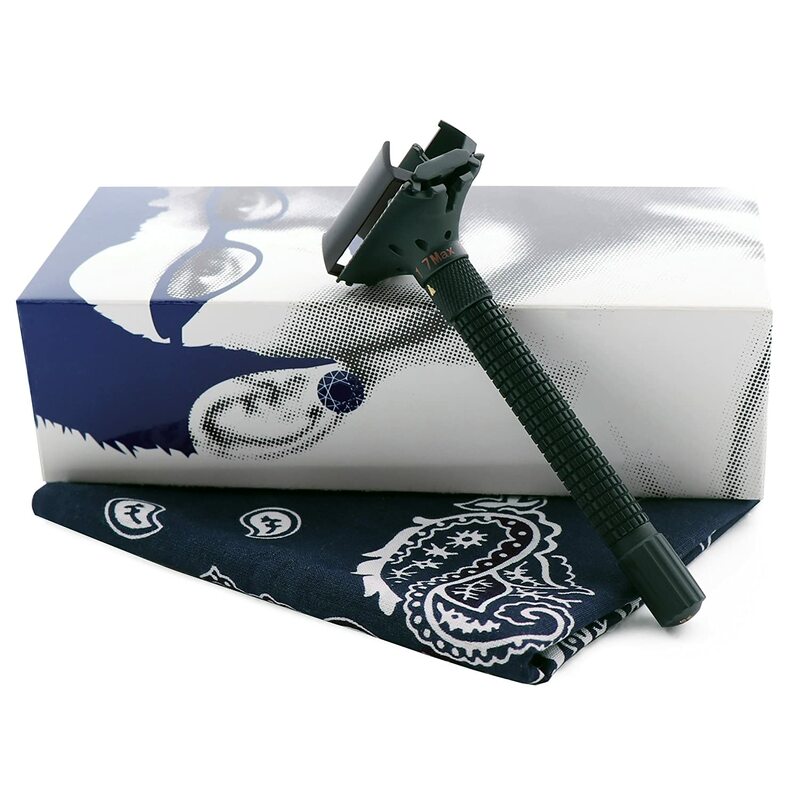 This is an adjustable razor with a shaving character that has long been called for. It is not without its quirks, however. Likes:+ The adjustment range is broad enough to get a very close shave, but also gets mild enough for those occasions when aggressive is not called for.+ The blade mounts uniformly in the razor with even reveal and exposure+ The blade exposure is negative -- meaning that the blade edge sits slightly below the shave plane formed by the safety bars and top cap, safely within the cove of those bars and top cap; it's a true safety razor+ The razor can provide a close shave by making the razor adjustment setting more aggressive or by adjusting to a less-aggressive setting and using more aggressive techniques such as razor buffing or J-hooking The razor has its quirks:- To open the butterfly doors wide enough to mount a blade without risk to its edges, the razor must be set to maximum aggression- To close the butterfly doors once a blade has been inserted, the razor's aggression setting must be dialed down from the maximum setting; if this isn't done, one of the butterfly doors gets hung up on a non-edge portion of the blade, and the doors won't close completely!- It doesn't have lather slots (a.k.a. gutter slots), but this does not affect the shave adversely. (Other much more expensive razors also lack this feature: notably the Merkur brand Progress and Futur models.) The lather and stubble removed from the face simply accumulates on the underside of the razor head and is easily washed away as is normally done. The razor does NOT clog as some might be tempted to claim. (That is, unless you are using the razor inappropriately. Some idiots attempt to use a mild safety-bar razor to shave off a week's growth of beard, for example, and then complain that the razor gets clogged. This is like using a pocket knife to screw in a wood screw. It's the wrong tool for the job. If you want to shave long hair, better to use an open-comb DE razor or a barber-style straight razor.) I can confirm my observations because I returned the first Weishi adjustable thinking that the above-mentioned blade-loading quirks were a one-time quality-control failure. However, the second razor was EXACTLY the same. So I give this product four, not five, stars for its quirks. After all, the vintage Gillette adjustables were similar in design (although, unfortunately, more aggressive in overall shaving character) but did not have this razor's blade-insertion peculiarities. That said, I accept the quirks because I think the quality of the shave-head design and the range of adjustment are unique (in that it adjusts to a very mild setting) among affordable adjustable double-edge (DE) razors. If you can live with its quirks (I can and will), I highly recommend this instrument. I have owned MANY DE razors, and have gone exclusively to adjustables for their flexibility in shaving character. I currently own the following adjustable DEs: a Parker Variant, a Ming Shi 2000S (designed after the Merkur Futur), a Gillette Slim, and now this Weishi. This new Weishi has replaced my Variant as my preferred, go-to daily shaver. Other info at ShaveLikeGrandad(dot)blogspot(dot)com.